Introduce your brand to the public with a promotional product that is sure to "stick" around. 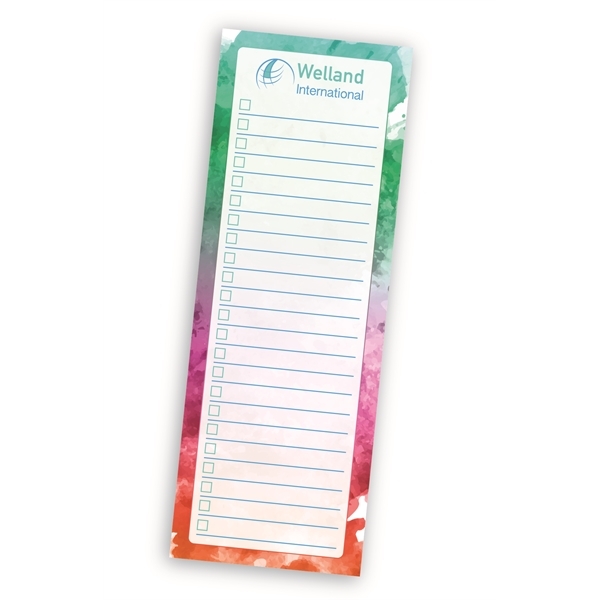 This Post-it® custom printed notepad comes with 25 white sheets of paper and measures approximately 3" x 8" (8" adhesive side edge). Add a brand name or logo using full-color printing with process inks for one low price. Logo colors are converted to the closest possible 4-color process match. Ideal for hotels, financial institutions, schools, travel agencies and many more businesses and organizations! Post-it ® is a registered trademark of 3M. Size: 8 " x 2.7/8 "
Imprint Size:7 5/8" x 2 1/2"